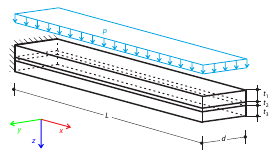 A composite plate, consisting of three glass layers, one foil layer and the inner space with the dry air is fully fixed and loaded with the variable temperature. Neglecting it's self-weight, determine plate's maximum deflection. Determination of the maximum deflection of the cantilever consisting of two glass layers and one foil layer in between. Plate is fully fixed at one end and subjected to the uniform pressure. 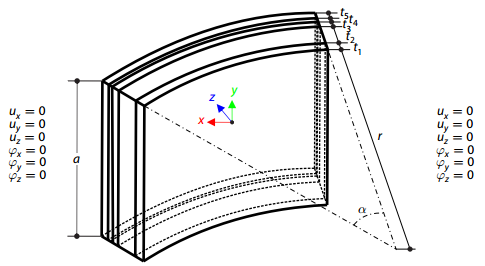 Determination of the maximum deflection and stress in the z-direction of the composite plate, consisting of two glass layers and one foil layer in between, subjected to the uniform pressure.